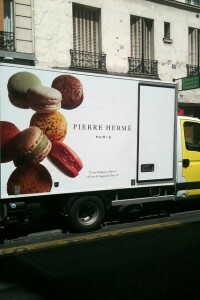 A while back, I wrote about the first food truck that hit the streets in Paris. And at the time, that truck, as well as the ones that followed, were spearheaded by folks from other countries making food from their various homelands. And I expressed some ideas for how, perhaps, the food truck phenomenon could encompass la cuisine française as well. Since then, a number of food trucks have, indeed, done that. And there are a number of people rolling around Paris, offering everything from candied nuts to Breton food. [I like the fact that their website says their salted butter caramel is “Fait camion” (truck-made), rather than “Fait maison” (homemade).] 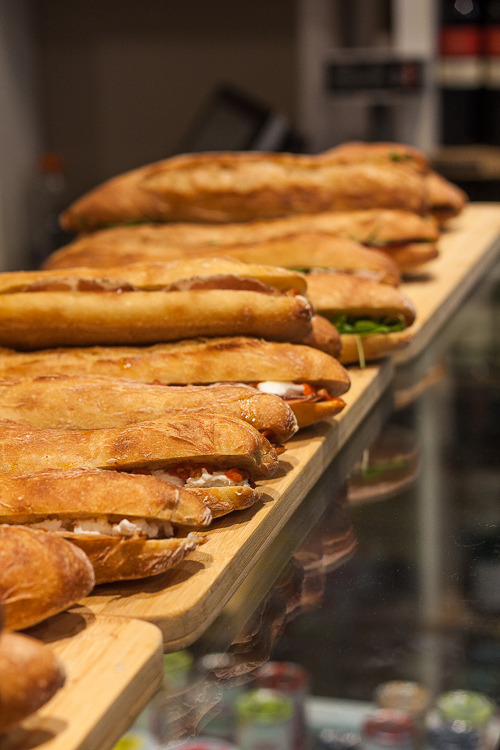 In spite of recent changes to dining habits in France, le sandwich remains a popular lunch and just about every bakery in Paris has a line that begins around noon of people clamoring for sandwiches to chow down on before they need to go back to school or work. 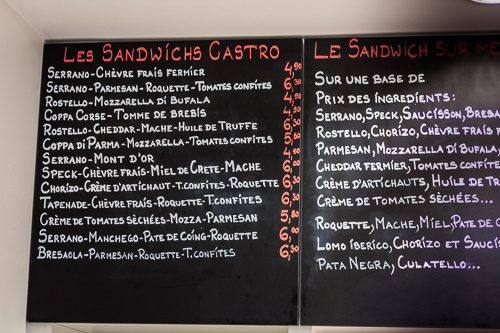 So I was excited to hear that Jérôme Boulestreau, who previously owned the Beillevaire cheese shop (which is now being run by people he worked with), opened up a sandwicherie with the Castro brothers. 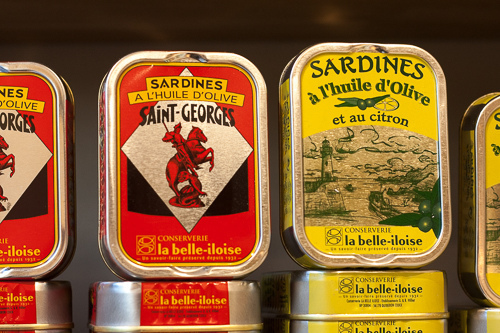 And in addition to sandwiches, their tiny shop is also crammed with interesting products like sardines from Brittany, tight links of Corsican sausages, Italian pasta, and even pistachios from California. One look at the blackboard and it’s obvious that this isn’t the place to find just the standard sandwich jambon-fromage. Instead, you’ll find a slew of interesting options that features Serrano ham and farm goat cheese, tapenade (olive paste), chèvre, arugula, and sun-dried tomatoes, or Corsican coppa with sheep’s milk cheese. 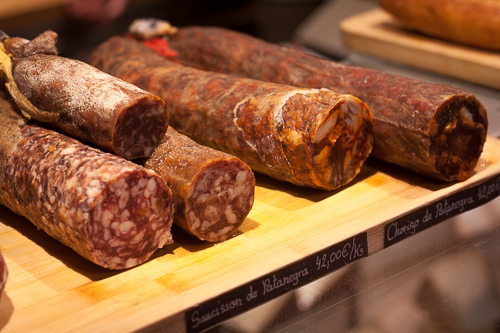 You can also request a made-to-order sandwich on excellent baguettes from Julien bakery, with everything from artichoke cream, Pata negra and lomo Ibérico (black-footed ham and pork tenderloin from Spain), Buffalo mozzarella, and honey from Crete, to Corsican sausage, English cheddar, and Italian air-dried beef. 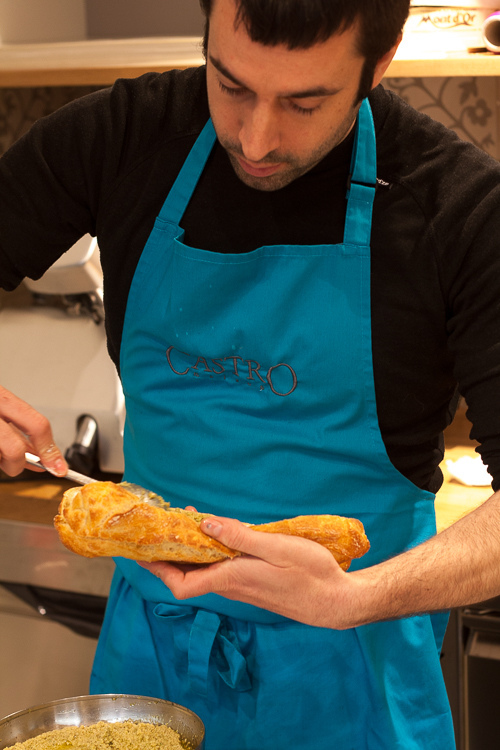 I could easily stay there all day and watch them make sandwiches, and chat with Jérôme and the other friendly counter folks, but due to its size, Maison Castro is more of a take-away joint. There are tables outside on the busy rue Cadet (map), which is one of the mini-market streets in Paris that doesn’t get a whole lot of press, but it definitely fun to stroll down mid-afternoon when the sun is shining and poke your nose into the various bakeries, butcher shops, wine caves, and cafés. 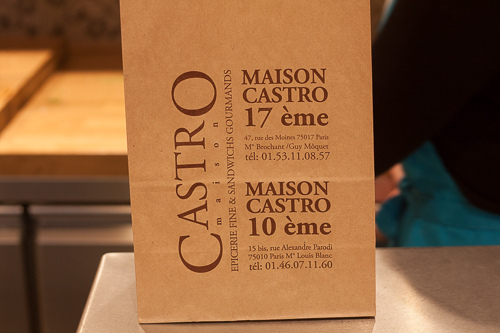 And if you come during nice weather, you can sit outside of Maison Castro and enjoy your formule gourmande (lunch combo) at one of the brightly colored tables and soak up some rays. The deal is that you get a sandwich, a drink, and a Beillevaire yogurt or other treat, for dessert. There are also pasta salads which they say are Mediterranean-inspired, and warm pasta, in case you visit in the winter and need to warm up. We stuck with sandwiches, which were, indeed, really great (although I am still a bit très américain and put more stuff inside my sandwiches than the French usually do). But this American, and his Mexican friends, were happy to be enjoying the best of France on a baguette together. The store-brand, premier prix pistachios at our local SuperU supermarket are labeled as pistaches californiennes. I’ve tried them and they’re pretty tasty. David, I have lived in France on multiple occasions in various places and adore les sandwiches of all stripes. 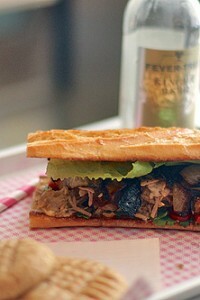 Hands-down the best sandwich I ever had was in Mulhouse, juste a cote de Strasbourg. A Vietnamese-owned sandwich truck sold a ‘nem sandwich’ – a crunchy, chewy baguette, split long, with generous shavings of fresh carrot, mint and cilantro leaves, and a liberal squirt of fish sauce with pepper, topped with three thumb-sized crackly/shattery pork nem/egg rolls, each the size of my thumb, laid end to end, and topped with a leaf of butter lettuce. Dear God, they were good. We literally stayed 3 extra days to keep eating the sandwich – Mulhouse doesn’t have a lot to offer otherwise. We ate those sandwiches twice a day for 5 days. A sandwich is arguably a British invention. In the South Pacific if you compare sandwiches in Vanuatu (a former French colony) and Fiji (a former British colony), the difference in taste is significant. We can guess which one is better. Just a few ingredients but knowledge can turn something so simple into something so phenomenal. 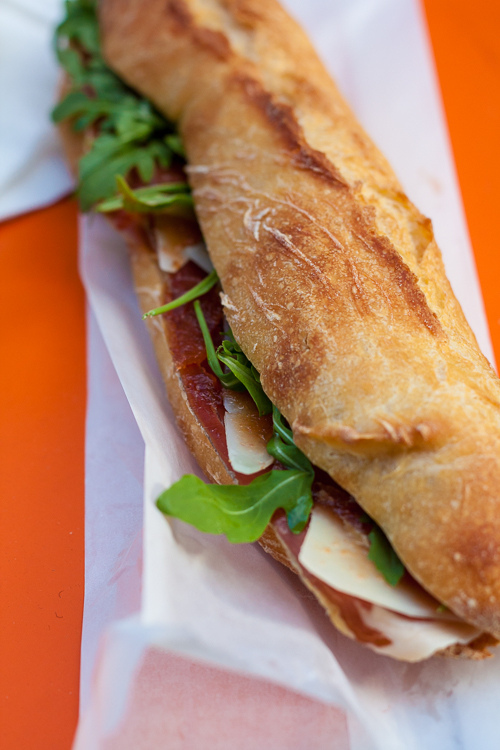 There are wonderful sandwich stops in the Marais. We found two in July and ate like kings each day, sharing sandwiches and desserts. Can’t wait to go back and find others! I love the idea of “Fait camion” vs “Fait maison”. 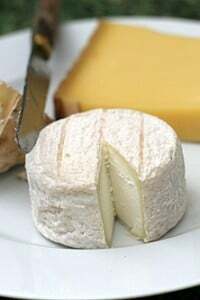 :) Between the cheeses and meats and breads alone in France, I can only imagine that their sandwiches are to die for. My 17-year-old son came home tonight after researching how he could make galette des rois – and asked if I had found my recipe. I sat him in front of my computer and showed him your blog post, promising to get on it tomorrow (book deadline not withstanding). Dilly-dallying before bed I caught this new post. Great sandwiches. I was just thinking tonight that sandwiches are my soul food (get asked that question a lot in Japan). But what is the jar of Riz au Lait à l’Ancienne??? My mom and I still talk about a tuna a sandwich we had in France almost 20 years ago! That and my first fried egg pizza… I’m a good polish girl, envious of all of the sausages! Another great post–David you make my day! Thanks. But I have GOT to stop reading your posts first thing in the morning since they have a tendency to set the ‘tone’ for my day. I have the bread started and the wine is chilling; plus I have searched out the sandwich ingredients inspired by this post and comments. My friends and I have a snow picnic planned for later and I think they are in for a David Lebovitz inspired treat. BTW–I made your King’s Cake recipe–it turned out superb even if it did leak a bit of filling; next time I will use a beaten egg white to seal the edges. I’m inclined to say that food trucks are so not Parisian but it’s great to know things are changing and that there’s a culinary globalization happening. Went to Disney World in December, and the best lunch is the jambon buerre in France at Epcot. The pastries are pretty darn good too. The first thing I ever ate in Paris was a ham sandwich and I sometimes think it was the best thing I’ve ever had. That crunchy bread, the ham, the butter-just an irresistible combo. But, my, does that list of ingredients on the board look good. Castro’s is on my list. I felt a kinship with you when you said “I am still a bit très américain and put more stuff inside my sandwiches than the French usually do.” That’s the first thing that came to mind when I saw your first photograph in this post. When visiting Paris, my husband and I have a habit of buying some nice prepared salads available at the local “Super Marche” and adding them to our lunchtime sandwiches. Or, better yet, making our own sandwiches. 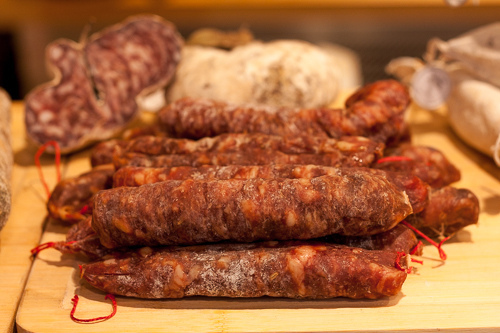 If only I had some of that wonderful ham from Barcelona I ate last fall, and a baguette and cheese from Paris…. Your post also reminds me of the book I am sure you’ve seen by David Tanis — One Good Dish. He has wonderful recipes in there for sauces — tapenades, condiments, rillettes and ideas for storing cheese in jars of olive oil and herbs (great ideas for sandwiches). 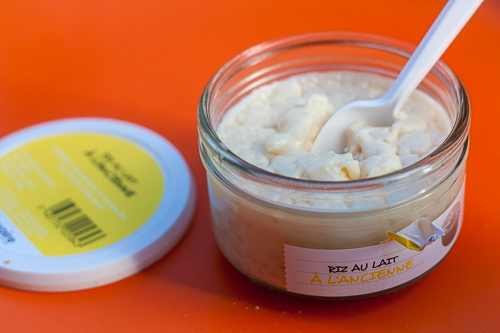 His mackerel rillettes recipe reminds me of your sardine pate….one of my faves. Those sandwiches look delectable. From the picture you can feel the crunchy coarse crust with the chewy centre and then all the delights of the filling. I can even smell it. Thank you for sharing (it is always a pleasure to fantasize about these beauties – from a gluten intolerant’s perspective). It is always pleasure. Congratulations to Jerome on his new adventure! He lead my little group in a cheese tasting at his shop up in Belleville a couple years ago and he is so charming and knowledgeable. It’s fun to catch little tidbits about him on your blog occasionally. 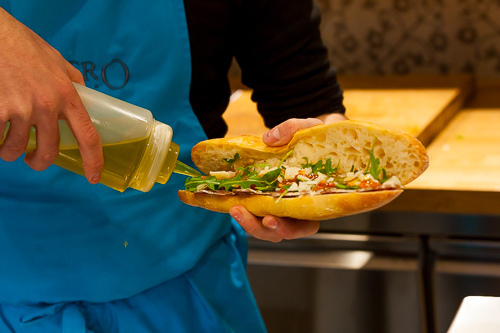 The sandwiches look wonderful–I’m adding these addresses to my list for March. Thanks for the heads up! I think it must be an European thing because I too was super disappointed with the ratio of meat:cheese:bread when I got jamon sandwiches in Spain. All I could taste was bread! I do concede that American sandwiches can get a wee bit ridiculous with the pile of meat/stuff spilling out between the bread but there has to be a middle ground! Iranian pistachios are said to be the best in the world, and without the trade embargo we here in the US hold with Iran, I’d die to get my hands on some in France! Thanks David for mentioning our breton food truck! We look forward to seeing you over a breton beer and a crêpe around our truck ! Would love to stop by – hope to have some Kig ha farz, too! That bread though! I saw the thumbnail and immediately started salivating. I need to make a visit! I look at this blog post and all I can think of is YUMMY! I’m sorry I can’t come up with anything more eloquent at the moment. Just looking at the bread in your first pic makes me heartsick. Where I live, good bread is not easily found . I must get back to Paris! May I recommend a new jazz club, on Rue Dussoubs, run by a friend—Club RaYé. Wish I could include a photo because the design is classy, black and white, in the Art Deco style. I’ve never been a bar-goer, but this is one place I will keep going back to. The bread looks amazing. What a treat to able to get such great sandwiches so casually. 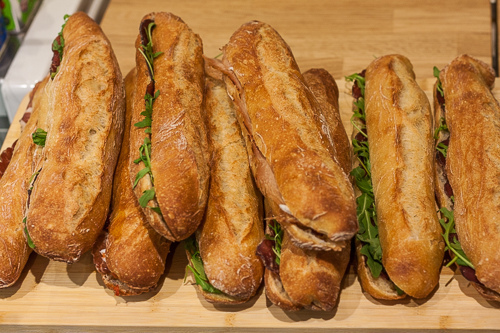 Those baguettes look absolutely fantastic! I am ready to climb into bed, and a little hungry and I can almost taste one of those sandwiches. The bread looks like it has a nice bit of chew to it. Mmmmmm, delicious!! Sandwiches here in Spain are indeed bread and a thin slice of something..NO butter…I find them impossible to eat.. my spanish husband cannot eat english sandwiches with butter.. so we are like Jack Sprat and his wife…but I have my memory of our last visit to France and the delicious bread and croissant..I would be the size of a hippo if I were so lucky to live there. I’ve heard of your site and just recently made it over for a visit. It’s just amazing! What I wouldn’t do for a sandwich like this right now! With bread that looks as good as that, much less stuffing so works! You convince me more and more that my next European vacation should include Paris.